Back to the Marathon hump and tons of birds..a great tuna bite going on this afternoon. When choosing the time of the year to call the best you have to think of what species they are after as fish come and go with the seasons and some are here year round but better during certain seasons. The best way to find out is to either call me or check my fish calendar or check out my E-Book. Let me clarify the answer everyone that everyone is looking for. The fall is the best time because we can catch a little bit of everything, sails, dolphin, marlins, cobia, big bottom dwellers, snappers, you name it is here in the fall. …when they show up you will be glad you have the gear on the boat when you see a beautiful color change or rip just off the reef. In the fall my offshore & deep sea charters in Marathon catch a range of sailfish, dolphin, wahoo, and tuna – a transition away from the loads of dolphin and tuna caught during the summer charters. There won’t be as many dolphin as the summer time, but in the fall there will be tuna, wahoo, kingfish, cobia to pick up the slack. 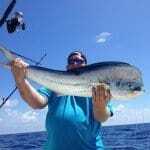 As for the distance in the summertime which is vast ranging from 10-40 miles offshore, the fall time fishing is best along the outer parts of the reef and not exceeding 10 miles from shore in most cases. Trolling live bait, dead bait or artificial, the fall is a great time to fish in the Keys, especially Marathon because of where we are located we can either fish Florida Bay/Gulf of Mexico or the Florida Straits/Atlantic Ocean. Technically it’s not the Atlantic, but just easier for most people to relate. Now we don’t do much trolling in the Bay because of the grass but drifting or anchoring using live bait, jigs, and lures is very productive. The offshore and reef fishing in the Florida Keys is done primarily the same way just in deeper water where similar applications designed for deeper structures are used. You may want to get a copy of Sport Fishing Magazine where my deep water bottom application is featured alongside other great bottom fishing captains. The fall is the best time because we can catch a little bit of everything, sails, dolphin, marlins, cobia, big bottom dwellers, snappers, you name it is here in the fall. The fall fishing has been great so far with big catches of dolphin and tuna. 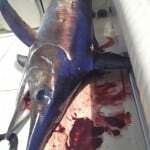 The sailfish are just starting to show themselves but wahoo fishing still slow for the meantime. Yellowtail snapper are numerous and the yellow brick road has been paved with decent sized fish in 80-50 feet of water. As we get into the cooler months the yellowtail will leave the deep water, not completely, but the majority and will begin their fall feeding on the topside of the reef. In the cooler months the use of oats isn’t a necessity but I can help some days. When using oats in the shallower water a constant scatter may ruin your fishing. The main contributor to this is as the water cools off the fish tend to slow down and don’t have voracious appetites and too much food will cause them to fill up. I find keeping them hungry, the bite will last longer, but it’s a fine line between too much and too little. I have found many times I have fed them too much and the only other recourse is to move to another spot. As wahoo season quickly nears many people are not prepared for them. Go get your planners, drails, or downriggers ready because when they show up you will be glad you have the gear on the boat when you see a beautiful color change or rip just off the reef. It’s some of the easiest fishing to do and doesn’t cost a lot to do. High speed or just a normal troll, wahoo can be triggered to strike strips, ballyhoo, mullet and lures. You don’t have to have live bait; these other baits work well too. The key to wahoo fishing when trolling is to cover ground with baits just under the surface. It’s a misnomer that you have to have a bait way down to catch wahoo. As long as you have a good bait swimming under the surface and not skipping your chances of getting a wahoo strike will go up. If you put your bait down too far you will be catching lots of kingfish and that’s fun and all, but if you’re playing around with kingfish you’re not catching wahoo. Now don’t get me wrong you can still catch wahoo 40-60 feet down, but most of your strikes will be kingfish. I like to use a two hook ballyhoo on a short piece of wire with some sort of dark or bright head or skirt in front. I think color can make the difference, but the color is what catches the fisherman. 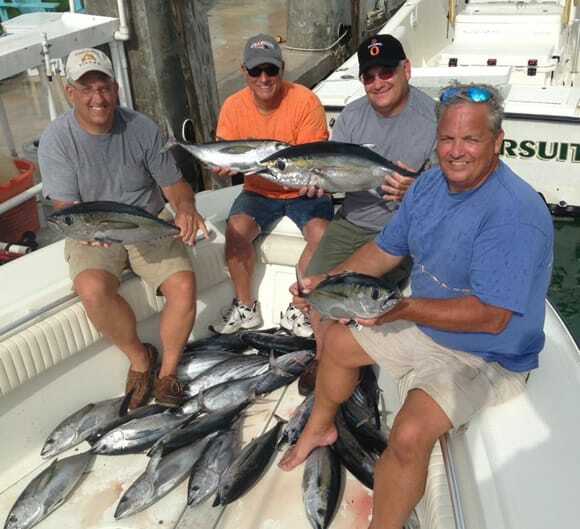 Book a Fishing Charter with Sweet E'Nuf Charters Today! Ready to make your own Florida Keys fishing memories? Check out the latest photos and stories from our most recent fishing charters in Marathon FL to see what's biting and what kind of adventure to expect. Or call 305-610-4778 to book a charter now.